Drip, drip…check that leaky faucet, info on Dell’s Tablets are here. 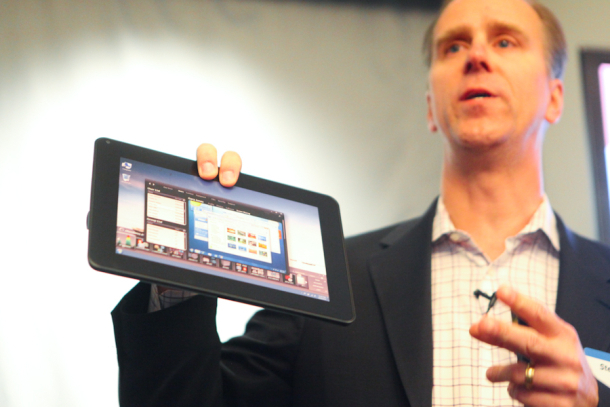 What we knew: Dell working on 10-inch tablets. What we know now: Dell’s upcoming Android 3.0 (Honeycomb) and Windows tablets. Coming in June, the Android 3.0 Streak Pro, 10-inches to touch a screen with resolution of 1280 x 800 pixels, an Nvidia Tegra T25 SoC (up to 1.2 GHz and have 3D capabilities), a model for data only connectivity, and two microphones, one with the Stage 1.5 UI. Trick or Treat? In October Dell is launching the Latitude ST, a tablet PC running Windows 7 that features an 1366 x 768 10-inch touchscreen, a 1.5 GHz Atom Z670 CPU, 2GB of RAM, up to a 128GB solid state drive, dual cameras (3MP at the rear, 1.3MP in front), GPS and an accelerometer, plus possibly an active pen support. Windows 7 will come sooner and a little bigger in July, Dell will be releasing the Latitude XT-3, a convertible tablet with a 13-inch display, a 2nd generation Core mobile processor, 4GB of RAM, pen input, and full 1080p output. As you’d expect, the XT-3 will have Windows 7 pre-installed. Encuentro que no sois derecho. Lo discutiremos. Escriban en PM.